The next improvement on Apples list is Better Siri responses. The personal assistant has been given some new guts. 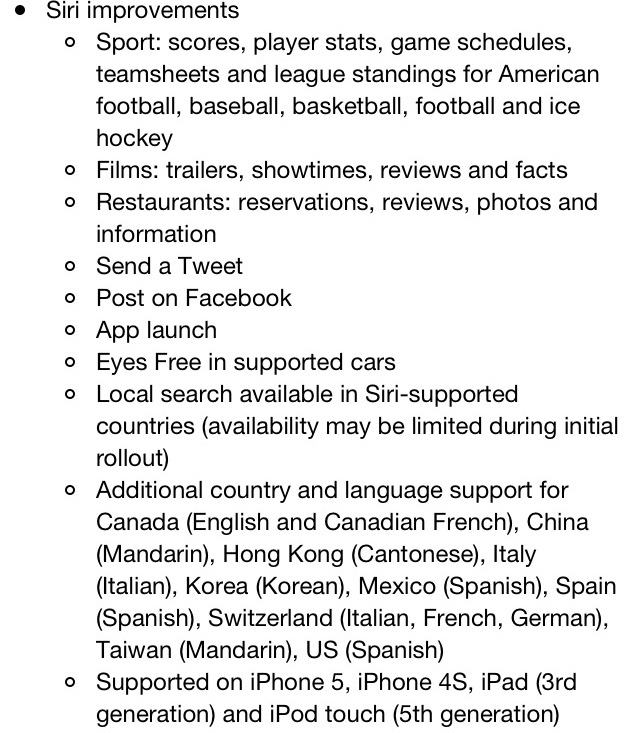 The list of improvements for Siri mentioned by Apple looks impressive. But we need to take time to explore which items are worthwhile. Can any move Siri out of its entrenched position as ‘cool gimmick‘? Because I am travelling on a train whilst writing this I’ll be civil and not try the features immediately. If there is one thing about Siri, it is annoying. The main reason that Siri’s improvement lists looks impressive is that a great chunk is based on changes to the available search options. Scores, stats and standings are apparently available for a small range of sports. The biggest stats game in the world, Cricket, seems to have been left out. Perhaps they couldn’t come to an agreement with ESPN CricInfo over access to the data? Still highly US centred, I think the inclusion of ‘Football‘ is supposed to cover European major leagues. An interesting and potentially global enterprise, cinema ratings, reviews and schedules could be a big plus. Searching for local cinemas is actually dead easy now, with apps like Cineworld and even Flixster providing excellent data. But a quick verbal search for your current favourite would be cool. This one I don’t agree with. I’ll probably never trust Siri to get things exactly correct in order to place a reservation. However, the quick verbal search for local restaurants, combined with reviews could be an interesting addition. Curious one, I thought searches of the nature above should be localised anyway(? ), no? Well, Apple clearly state at Local Search is a trial feature. The same statement says that it may be limited during the trial. Really? Because it takes so long to type 140 characters? I guess this is an extension of the iMessage integration, simply allowing you to communicate “quickly” more easily. If this works from the Lock screen I’d a benefit and time saver but that would also be a security hole. Also, I guess careful review of the text would be a good idea. In for a Penny? I guess Apple may well have included this. Review postings though, thoroughly, before accepting. Now I’m on Facebook and Twitter but I can’t see me ever dictating an update to Siri. I’m guessing here but this only works when the iPhone is unlocked? Might be useful if your phone’s particularly disorganised but it probably doesn’t save any time. I was actually one of the people that thought this was a good idea but I’ve cooled to the concept since. First we had hands free, now eyes free. The idea is that you have a proper conversation with you iPhone/car. You ask for an action, you get a response, you correct or accept… all without taking your eyes off the road. If I ever see this in action, I’ll let you know. For now I’d stick to the tried and trust “remote control by passenger access”. Feature available in all cars. Welcome to Siri all you speakers of Canadian English, Canadian French, Mandarin Chinese, Taiwan Mandarine, Hong Kong Cantonese, Italian, Korean, Mexico Spanish, Spanish, American Spanish, Swiss Italian, Swiss German, Swiss French and nope, that’s it. It’s an impressive list that, along with the original few languages, means most of the speaking world is covered. I have found that Siri is more accurate with my unusual British accent now. I have yet to see the ludicrously and widely incorrect ‘guesses‘ that seemed to pervade the previous version. All of which is odd. Why? Because this is essentially an online service. It can be tweaked and upgraded/updated at will for all users. Simultaneously. The App running and in-carrfeatures would require APIs of some sort but the rest seem, well, normal. As the service develops I’m sure it’ll get better but the process does seem slow. Like iOS 6 itself these changes to Siri seem more like tweaks than major updates. I did, eventually, get to play with these features a little and, whilst on WiFi at least, it was very responsive and seemed to be able to more accurately interpret my accent. Here’s he list of functional examples built into Siri. Impressive. But still feels gimmicky. The single failure of this service though is that it requires you to be on a pretty good connection to the Internet. Without that Siri is Dumb, in both senses of the word. So, update welcome but not really a key feature, okay. 👌🌟🌟🌟💢💢.